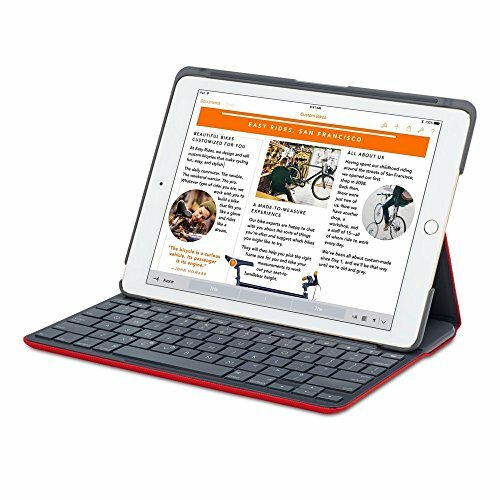 Perfect for when you want to say more with your iPad, the Logitech Canvas Keyboard case provides protection along with an integrated keyboard. Offering a familiar, fast, and accurate typing experience, this thin, lightweight case lets you use your iPad like a laptop. Canvas features a built-in Bluetooth keyboard with well-spaced keys, iOS shortcuts, and versatile viewing positions to help you get more done. Position your iPad upright for typing emails and chatting, or lay it flat to read and browse in comfort. When the iPad is positioned upright, the keyboard auto on/off feature ensures Canvas is ready for typing when you are. When surprises come your way, the Logitech Canvas is ready, with durable and liquid-repellent materials to protect your iPad. Troubleshooting for Bluetooth connection issues: a) Make sure your keyboard case is charged. Turn your keyboard on by resting the iPad on the strip above the keyboard. The status indicator will be red if your keyboard has less than 20% battery life left. Connect it to a power source. b) Try un-pairing and re-pairing your keyboard case from your iPad. Here’s how: On your iPad, tap Settings and then Bluetooth. In the Devices list, find Canvas Keyboard Case, tap the information icon to the right, and then tap Forget this device. Rest your iPad on the strip directly above the keyboard to turn the keyboard on. The status indicator on the top right will glow green. ; Press the Bluetooth connection button on the right side of the keyboard to put it into discovery mode. On your iPad, tap Settings, then Bluetooth settings, locate Canvas Keyboard Case in the Devices list, and select it. Once the connection is made, the indicator will turn solid blue. Your keyboard is ready to use. Tagged 920007273, Canvas, Case, Folio, iPad, Keyboard, Logitech. Bookmark the permalink.